Valentine’s Day is coming up and it’s a perfect opportunity to thank your donors and show how much you appreciate their support. Okay, maybe you think doing something for Valentine’s Day is hokey, but you should still do something fun and creative to show appreciation this month. The holidays are over, winter isn’t, and the world doesn’t feel like a very nice place right now, so we could all use a little pick-me-up. This is also a good opportunity to stay in touch with the people who gave to your year-end appeal, especially first-time donors. If you haven’t shown any donor love since your year-end appeal, then you definitely need to reach out now. Videos are becoming an increasingly popular way to connect. Here are a couple that I received recently by email. You’ll notice that both are short (and they need to be short), donor-centered, and show the organization’s work up close and personal. In addition to saying thank you, share a brief update or success story. Emphasize how you couldn’t have helped someone without your donor’s support. For example – Thanks to you, Jenna won’t go to bed hungry tonight. If your budget doesn’t allow you to mail handwritten cards, is there a way you can change that? You may be able to get a print shop to donate cards. You can also look for additional sources of unrestricted funding to cover cards and postage. Maybe you need a change of culture. 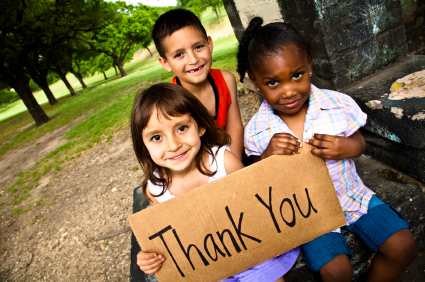 Getting your board, all staff, and volunteers involved in thanking your donors will make a huge difference. You can’t say thank you enough. Make a commitment to thank your donors at least once a month. You don’t even need to wait for a holiday or special occasion. Just thank your donors because they’re incredible and you wouldn’t be able to make a difference without them.